I’m incredibly passionate about humor in the workplace and not because it’s fun. As an engineer, the reason why I care about using humor is that it works. It’s effective with the one thing you can’t be efficient with, human beings. 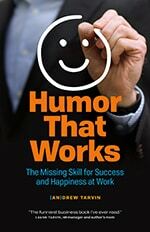 So with that in mind, here are 30 benefits of humor at work, backed by research, case studies, and real-world examples. Want to see the latest research on humor? Check out the humor benefits page. Want to implement humor at work? Check out our humor training. 1 Humor in the Workplace: Anecdotal Evidence Suggests Connection to Employee Performance, Lauren Breeze. Perspectives in Business, St Edwards University, 2004. 4 A funny thing happened on the way to the bottom line, B.J. Avolio. Academy of Management Journal Vol 42, 1999. 5 “Laughing All the Way to the Bank”, Fabio Sala. Harvard Business Review, F0309A. 6 “A Dash of Humor Ups Performance and Creativity at Work”, Robyn McMaster. Brain Based Biz, September 2008. 7 “Secret’s of America’s Happiest Companies”, Lydia Dishman. FastCompany, January 2013. 8 “Why Hewlett-Packard is Hiring Dancers”, Cheryl Strauss Einhorn. CNN Money, April 2013. 10 “Sense of humor as predictor of creativity level in University undergraduates”, Saba Ghayas, Journal of Behavioural Sciences. 2013. 11 “Let the Good Times Roll Building a Fun Culture”, David Stauffer. Harvard Management Update No. U9910B. 12 An Explanation of the Relationship between Instructor Humor and Student Learning, Melissa B. Wanzer. Communication Education Vol. 59, January 2010. 13 Humor at Work: Putting Mimes to Good Use, Mike Kerr. Inspiring Workplaces Issue 521, January 2014. 14 Humor, Analogy, and Metaphor: H.A.M. it up in Teaching, Randy Garner. Radical Pedagogy, 2005. 16 Positive Emotions Preferentially Engage an Auditory-Motor “Mirror” System, Jane E Warren. The Journal of Neuroscience, December 2006. 17 “Humour and Laughter”, The Handbook of Communication Skills, Hugh Foot. Routledge 2006. 18 The power of emotional appeals in promoting organizational change programs, Shaul Fox. Academy of Management Executive Vol 15, 2001. 20 “Why Humor Makes You More Creative”, Drake Baer. FastCompany, May 2013. 21 “Getting Serious About Workplace Humor”, Martha Craumer. Harvard Business School, C0207D. 22 Letter from the President, Jill Knox. AATH Humor Connection, September 2013. 24 Positive and Negative Styles of Humor in Communication, Arnie Cann. Communication Quarterly. Vol 57, No 4, October 2009. 26 “Humor Theories and the Physiological Benefits of Laughter”, Julia Wilkins. Holistic Nursing Practice, December 2009. 27 The Effect of Mirthful Laughter on Stress and Natural Killer Cell Activity, Mary P. Bennett. Alternative Therapies Vol 9, No 2, 2003. 28 “Ha! Laughing is Good for You!”, Amy Toffelmire. Canoe.ca, April 2009. 29 “Give Your Body a Boost with Laughter.”, R Morgan Griffin. WebMD, June 2012. 30 Aging Well by George E Valliant. Little Brown, January 2002. Humour can be an excellent stress reducer. Take time to be with people and give others your time, it really does make a difference. Humour does not have to be accurate nor necessarily humorous. For example: ” What did the Buffalo’s Mother say to her child when he was going to College?” …. BISON… Keep smiling, it really can be the best medicine..